Government of Rajasthan Recruitment Notification 2018.RSMSSB inviting applications for the positions of Pharmacist.Interested and Eligible candidates can apply for the positions. Diploma in pharmacy is the qualification for applicants to apply and applicants must be registered in pharmacy council. Applicants must have knowledge on Hindi and on Rajasthani Culture. Minimum age for applicants to apply is 18 years and maximum age is 40 years as on 01.01.2019. Selected candidates will get pay in pay matrix of level 10. 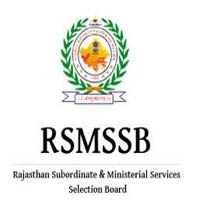 Mode of applying for RSMSSB pharmacist recruitment is through online from 16th August 2018 to 15th September 2018.
http://rsmssb.rajasthan.gov.in/ is the link for applicants for applying purpose.